As PLASA London waves goodbye to it’s Earl’s Court home to seek new pastures at ExCeL in 2013, On Stage Lighting guides you through the retina burning LEDs to see what 2012 show had to offer. The trade show calendar is filled with places to see and be seen and PLASA London could do with some spit and polish. The more intimate PLASA Focus in Leeds and the much larger Pro Light & Sound in Frankfurt bring different vibes to the trade show world in our neck of the woods and the US based LDI will come even hotter on the heels of PLASA in the autumn season next time around. The Professional Development programme of free seminars seemed to have expanded again this year. Bookings for an increased number of free seminars appeared strong, particularly for the London 2012 Olympic Games related content and sound enthusiasts especially were treated to a wide range of audio presentations this year. The downside to this expansion was that the temporary theatres in EC2 were not always conducive to good listening or a decent blackout. You have to feel sorry for the sound technician battling with intelligibility and feedback in a room full of professional sound guys. It must be like drowning in front of the Team GB swimming team. In the Age of Austerity, everyone is looking for ways to get more from what they have. Manufacturers have seized upon this aspect of the zeitgeist, along with the continuing “sustainability” theme. Certainly the “S” word comes up a lot. The actual meaning seems to be rather, erm, flexible, depending on how you like to spin your particular new piece of kit with it be ETC Dimmer Doubling or everyone with LED based kit making a huge assumption that LED = “Sustainable”. One long standing Chief LX remarked that his regional rep theatre got their 1K fresnels in 1970-something, something to bear in mind if you badge something “sustainable” just because it doesn’t use a tungsten lamp. Everyone seemed to have come to Town with their LED profile following on from last year’s early attempts, with the now finished ETC LED Source Four being the most feted with a PLASA “Sustainability” award to add to it’s collection. The ETC unit uses the 7 colour Lustr+ collection of LEDs from the Selador and is optically exactly the same as the rest of the Source Four profile from the gate forwards. The awkward iris fiddling by the rep did cause a certain amount of amusement plus reassurance that the familiar quirks continue in the new product too. Apparently, the LED back end can also be used with the ETC Source Four Zoom units, if you’d like to increase your range of design faults in a single unit and we’d suggest adding the yoke balance kit to really frustrate your gobo or iris fitting activities. Plenty of LED profile spot action in other camps including the Robert Juliat range, the Selecon PL4 and the Prism guys in the White Light zone adding a LED fresnel to their leko of last year. The Ilumo Zoom LED Spot we looked at earlier in the year now had it’s own stand. Not everyone was boasting full colour mixing with their warm / cool white LED driven fixtures, instead pushing the sustainability angle and the thorny issue of Lumens Per Watt which usually prompts the question: “Ah, but Lumens Of What?”, relating to challenges in colour rendition with LED light sources. It seems that in the world of LED stage lighting we are still talking “less for more” when it comes to light quality and purchase cost. And we should be careful when we hear “sustainable”, despite the current climate where policy makers and those with the purse strings seemingly sign off any specification with LED in the document while basking of the ignorance of not really understanding about light quality or what the numbers mean. 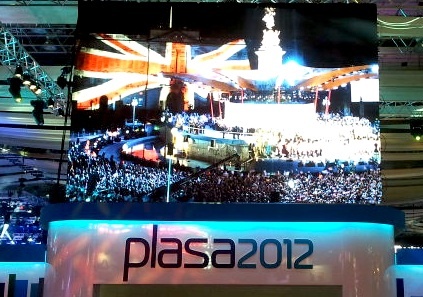 With the continuing activity in the LED space, PLASA 2012 was memorable in part for what seemed like the final public unveiling of the solid state Elephant In The Room in which the challenges of using LED in performance lighting were candidly faced by many stand reps and in seminar presentations including ETC’s visionary CEO Fred Foster. No longer were punters treated to straight faced spiel about lumens per watt, “white” light or the fact that LED fixtures could reproduce 16 million colours and cure cancer. While in a seminar theatre, attendees were treated to a well presented debunking of LED myths by Mike Wood, on the show floor the reps felt able to ‘fess up to stuff while warning buyers about the dangers of published photometric data. Of other manufacturers, natch. A key issue is that LEDs emit colour that is hot at certain frequencies and deficient in others which gives rise to unexpected results in all sorts of situations. 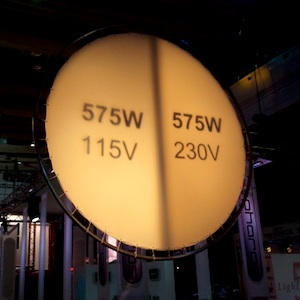 While LED dimming may have improved, costs of manufacturing been brought down and optical issues worked through, the plain fact is colours produced are not the same as, say, a tungsten halogen with a colour gel in it. 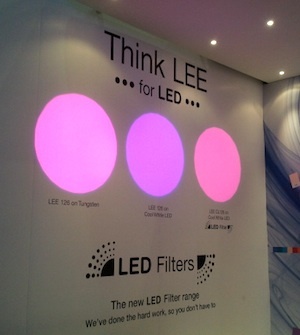 Lee Filters have cleverly crunched some numbers to produce a small range of their traditional filter colours specifically for LED products and were showing a comparison using L126. It’s inescapable that even “white” LED light sources don’t produce colours in the same way as incandescent and even if the hue looks correct reflected on a white wall, the actual colour components are quite different. This was easily revealed to anyone that cared to stick their hands in the standard L126 light vs. the corrected LED L126 to see that even the great Lee Filters can’t suddenly produce light that isn’t there to start with. The tungsten / L126 combination wins hands down. This problem is not news to anyone and is the reason the ETC Seladors and the new S4 profile use 7 different LED colours to mix their output instead of the common 3 or 4. If LEDs are to be used for much more than cyc lighting and eye-candy, or even general purpose lighting in your office, the issue of colour rendition will need to be resolved. Last year, On Stage Lighting noted that stands at PLASA were getting harder to be around due to the number of light “shows” that assaulted the eyes on every corner. 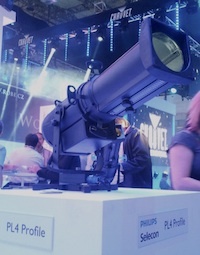 The 2012 show actually had an identifiable problem with light pollution, made most obvious by those exhibitors keen to show off their latest strobes but also any other stand packed with waggling, high brightness sky junk. 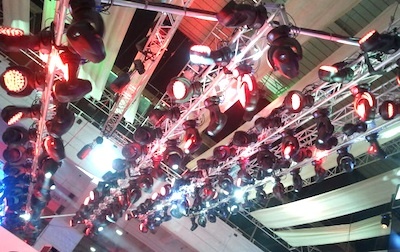 Over the years, the exhibition organisers have somehow clamped down on sound systems pelting at the poor trade show goer – now the problem is lighting. Getting down to business, you’d better enjoy a facefull of strobes or flying Sharpies whizzing past every few seconds and huge LED wall playing bright, fast cut content. ETC had cunningly rigged up the black drapes of their demo area between them and some of the worst offenders but many of the smaller booths just had to put up with their neighbours driving interest from their stands. While some of the world’s most celebrated lighting designers congregated in seminar rooms, out of the show floor not one major stand evidenced the touch of an actual lighting designer. One wag from one of the biggest names in lighting equipment reminded us that “The shoemaker’s children go barefoot.” and certainly some of the best lit areas were shell scheme stalls using those unsustainable tungsten PAR38 track lights. Stands with “real” lighting equipment were bathed in vile scrolling LED hues in between huge black holes and the skin tone of the masses in Earl’s Court were as bad as you’ll see in a multi-storey car park at night. It is perhaps telling that the lighting product industry can annually produce further versions of the LED articulated frying pan and yet apparently can’t find anyone to light their stands properly while LDs like Paule Constable still perform wonders with the PAR64 in the theatre. In the knobs and sliders department, the race to backfill every corner of the lighting control that you currently don’t occupy continues. 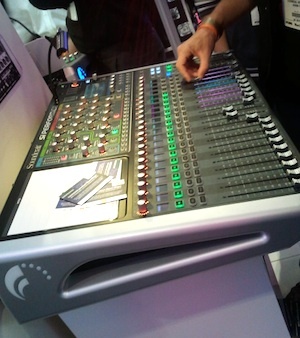 The enormous desk makers like MA have even started to proffer PC wings and Avolites presented the Titan One single universe dongle, while at least one software only lighting controller maker brandished a front panel blank of some soon-to-be hardware. Philips brand Strand persists and offers the new ML250 which seemed to be aiming at the SmartFade ML / Huge Frog market in case someone, somewhere needed a small-medium moving light controller and couldn’t find one. Anyone ML programmer that remembers the short lived Zero 88 Sirius 250 or the Jands Hog 250 may find that particular integer brings back too many memories. Cham Sys (a contraction of Chameleon Systems, as the pronunciation always seems to cause confusion) continue to dangle the ethereal MQ60 (and 40 and 70) which they have done for over a year, this time with a facelifted box. The dev toolkit for the Cham Sys software has been changed in order to bring the free Cham Sys Visualiser to the table. Because everyone has to have a visualiser bundled with their wares these days, this in turn forces the dedicated vis guys to downscale with single universe options and free student licenses as with Capture Polar. Hopefully the developer’s move will mean that the MagicQ software gets the shiny bits treatment to keep the iPhone generation on side. 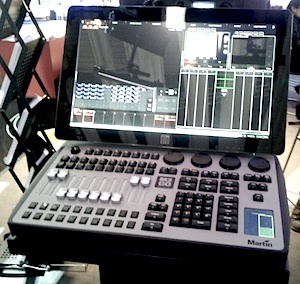 The look of lighting control la mode is rapidly becoming the MA2 / Titan / Martin – esque grey grads everywhere and desk makers need to keep up appearances. 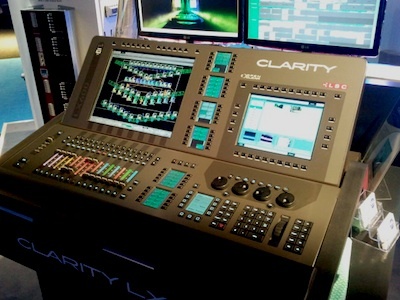 Speaking of which, the LSC Clarity-LX was put on our radar and so prompted a demo. LSC haven’t always had the biggest name in the UK, appearing to us to make lower end lighting desks and be lumped in with the Jands type consoles of the past. The big and shiny Clarity has got some Vista lineage which shows in parts of the interface and the desk looks to be aimed as a GrandMA killer, it certainly had a lot about it and could be worth watching. The Clarity also sported the de rigeur dark grey gradients, as does the M2Go from Martin. The M2Go is playing in the small, portable and powerful niche and, despite having never used a Martin desk before, I walked up to it and managed to record groups, palettes and cues with a few button pushes. The M2Go’s clean hardware interface seems to make it simple to use, with plenty of touchscreen opportunities for powerful programming. Continuing the simple but powerful, Zero88 have rebadged the Leap Frog as the Solution in an attempt to move away from quirky Frog-like names and free themselves from the schools market. The Solution, like the Orb and other iterations, all use the ZerOS 8.0 software which, like Zero 88 products of the past, has a lot of thought put into it and is better than you probably think it is. It’s gratifying to know that the best features of the latest software version are still able to be used on previous Leap Frogs that used ZerOS and that your old green desk with the 3 Tonka wheels could have a new lease of life. Treat it to a touchscreen, for a start. Zero88’s biggest brand strength in one market is also their weakness in others and while the Orb may be gaining the odd bit of traction in the ETC Ion world, perhaps Cooper Controls will steadily try to reposition or spin off a new brand. The rebadging of Leap Frog consoles could be the first shot in a bigger campaign. 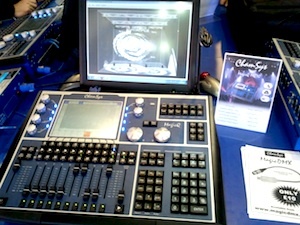 When every LX control shoemaker is trying to fulfill “all of the colours in all of the the sizes” and leave no user or situation without a solution, deciding on a platform to buy into or even learn is becoming increasingly onerous in a crowded market where even Soundcraft have tacked DMX lighting control into the Si Performer digital audio console. Lawks a mussy, whatever next? 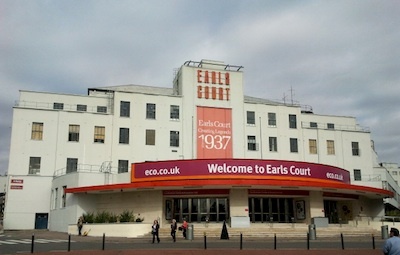 As the familiarity of Earl’s Court and the September diary entry comes to an end, the PLASA London show has the opportunity to build on it’s strengths in professional development and conferencing and the chance to create a new show floor in a different space in 2013. With any luck, this will be a lot easier to attend than the shows of recent years, including this one. Perhaps we can even wish for the odd lighting design on a stand and rules in place to combat the light pollution issue. The show this year was fairly muted by a difficult economic picture and a bumpy performance landscape despite the odd Jubilee or Olympics to keep us going. Everyone seemed to be going through the motions to a certain extent, attending or exhibiting. In some ways, technology development has been driven in the last few years by trying to shoehorn an LED into everything and backfilling across your current market. Now we finally have an LED in everything, and everyone makes every size of everything, what are we going to do next? This article has been brought to you in partnership with Trace Lighting’s Limelight – Lighting Control Software. 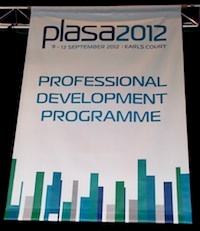 If you attended PLASA London 2012 and have any thoughts, pop them below in the comments as usual. 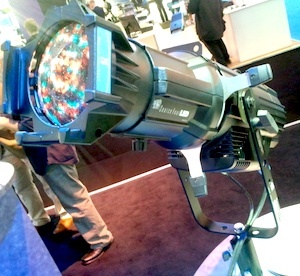 How do you like the new LED Leko as opposed to the original? Haven’t seen them in action yet and was thinking of picking up a couple.